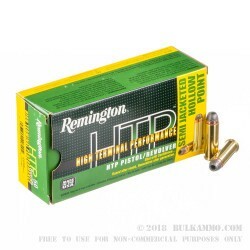 Proponent's of Dirty Harry's caliber of choice will praise the performance yielded from Remington's new brand of self-defense ammunition. 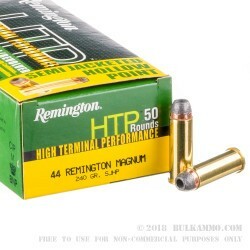 These .44 magnum rounds belong to the High Terminal Performance (HTP) line and are constructed using the best components available. 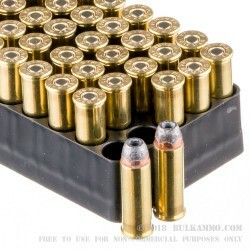 This includes reloadable brass casings, clean-burning primers and propellant, and semi-jacketed hollow-point (SJHP) projectiles. The bullets selected for this cartridge weigh 240 grains apiece and loaded for relatively light recoil and a flat flight path. This particular SJHP design possesses a copper jacket that slightly extends past its crimp and grooved cannelure as well as a deep-seated cavity in its exposed lead top. The overall rounded shape and flat tip offer revolver and lever-gun owners easy reloading and safe magazine tube storage. Upon impact, the round will experience mushroom-like expansion that is kept in check by the cannelure and strong base jacket. 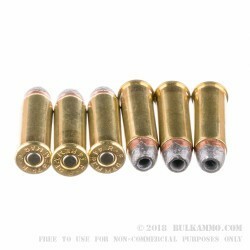 The enlarged bullet will penetrate into vital organs before coming to halt in order to deliver threat-dropping energy. Remington is 200-year-old U.S. company that combines traditions, ingenuity, and the most recent in electronic assembly technology to give shooters depend ammo selections.